Vermont celebrates 225 years of statehood in 2016, having formally entered the Union as the fourteenth state on March 4, 1791. There was a great deal of popular support for joining the United States at the time, but it was far from the only option being considered. Some Vermont citizens favored remaining an independent state, while others advocated for joining Great Britain. The faction headed by the Allen brothers and Governor Thomas Chittenden had held numerous diplomatic discussions over the years with representatives from Great Britain, most notably the Haldimand negotiations during the Revolutionary War. Negotiations with Britain continued long after the war, right up until Vermont’s admittance into the Union. Levi Allen, brother of Ethan and Ira, played a large role in these discussion, in no small part to protect his growing land holdings and trade activity in Quebec. Levi was sent to England in 1789 by his brothers and Governor Chittenden with instructions “to Assure the British Court that Vermont was truly from local situation as well as inclination firmly attached to them.” In addition, Levi pursued a number of commercial opportunities including an effort to provide the Royal Navy with ship timber. Levi attempted to return via the St. Lawrence, but the captain diverted the ship to Georgia due to weather conditions. Returning to London to protect his return cargo in early 1791, Levi belatedly learned of Vermont’s entrance into the Union. Levi, and others who preferred becoming a part of Great Britain, were attracted to the idea for economic reasons. Lake Champlain and the St. Lawrence River were major trade routes for northwestern Vermont, and whether Vermont became a part of the United States or Great Britain had great implications for commercial relations with partners along this route to the north. Levi returned to Vermont in the 1790’s and continued to pursue land and trade opportunities in Quebec, but like his brother Ira fell into a great deal of debt, ultimately dying in prison in Burlington in 1801. This letter from Levi and many more can be found in the Allen Family Papers in Special Collections. 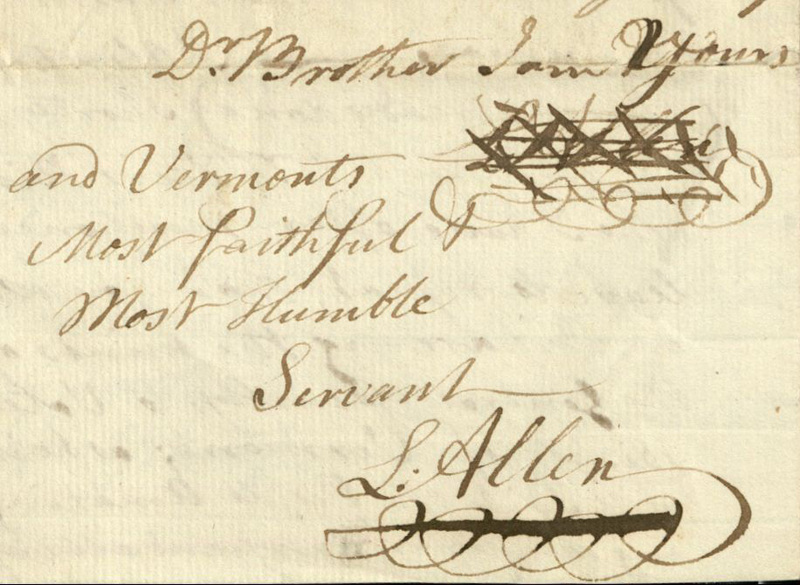 This entry was posted in Manuscript Collection, Vermontiana and tagged Allen Family Papers, Ethan Allen, Levi Allen, Vermont statehood. Bookmark the permalink. That is an excellent treatment of Levi Allen’s letter to Ira and Nancy on the matter of Vermont joining the United States. Fine work.